By 2006 the pond at Hanley Swan was in a sorry state. Over 100 ducks, half a dozen geese and assorted moorhens were causing serious problems of pollution and erosion, since vegetation had little chance to get established before being eaten. To make matters worse, many visitors cannot resist feeding the ducks with bread, much of which falls to the bottom of the pond and rots, making the water slimy and unable to sustain plants. And the duck landing stage in the middle of the pond was disintegrating. The first stage in restoring the pond was for volunteers to make willow revetments to stabilise the banks. The geese were removed and the number of ducks reduced to give the pond a chance to recover its picturesque appearance. Then in 2009 Russell Farraday designed three new floating duck houses, built by Barry Bruton, and installed them around the willow tree. The new pond warden, Neil Verlander, ably assisted by Gigi, the Duckmeister, organised a group of volunteers to clear the scrub that had accumulated in the woodland behind the pond over 30 years. He made an appeal for donations of Malvern stone to reclaim the bank and received over 20 tons of rock, which was transported and laid by a Community Service workforce. Francis Harcombe supplied topsoil and heavy equipment. Picnic benches have been installed and a programme of planting carried out, including over 600 daffodil bulbs, all donated by the Café & Market. Floating duck food is being sold in the shop and the pub, and the pond is now looking better than it has for many years. This entry was written by Malcolm Fare, posted on Jul 13, 2010 at 2:00 pm, filed under Village News and tagged Village Pond. Bookmark the permalink. Follow any comments here with the RSS feed for this post. Trackbacks are closed, but you can post a comment. The Ewe and Lamb was in the Welland Road – I’m not sure when it closed, but it was still open when we moved here just over 30 years ago. 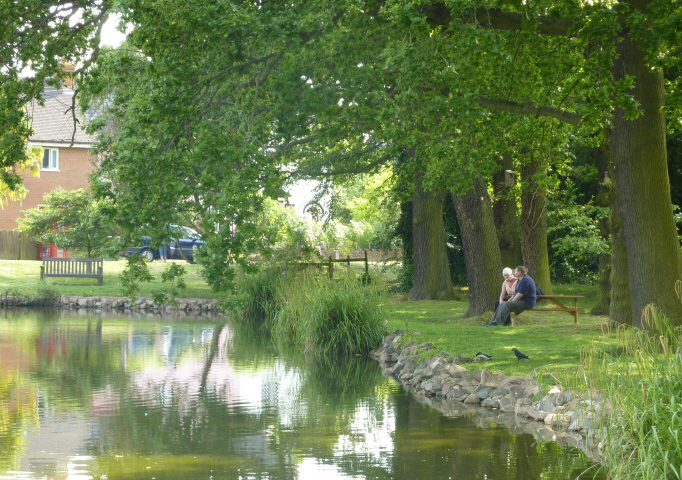 I am very pleased with this news and to learn the beautiful pond is now restored to its former glory. I have a special relationship with the pond,having left the pub late one evening in February 1958 in a very relaxed frame of mind and walking straight into it,having to be rescued by my drinking companions.